A bit more about me. I live in the Tampa Bay area in Florida with my family. Being a foxhound, I have a lot (I do mean a lot) of energy and I need a great deal exercise otherwise I tend to get grouchy. You may not believe it but we dogs can and do get grouchy and its no fun all around. Fortunately, my family understands, and they try their best to take me out for 2-3 walks a day and I also get to play in the backyard. I love being outdoors. I like long walks. And I love to run. We live in a suburban area, and we have different types of critters all around us. Lots of squirrels. Bunnies. Ducks. Unidentified rodents. And more. I sometimes chase bunnies and other smaller creatures, but I absolutely adore squirrels. I can spot one from 100s of feet away! But, you know what? For some strange reason, no matter how hard I try, I can never catch one! And these pesky squirrels just sit there and tease me. Ugh, I hate that! As soon as I try to go after them, they run up a tree. I have tried over and over again but so far, no luck. Any suggestions on how to catch one? It’s sad but I’ve been scolded and yelled at so many times for trying to chase squirrels that I’ve lost count. And God forbid I make any sudden moves that take my family unaware. They get plenty upset. Is there something wrong with trying to catch a squirrel? Funny because the other dogs in my neighborhood tell me that they get yelled at just like me when they try to go after a squirrel! 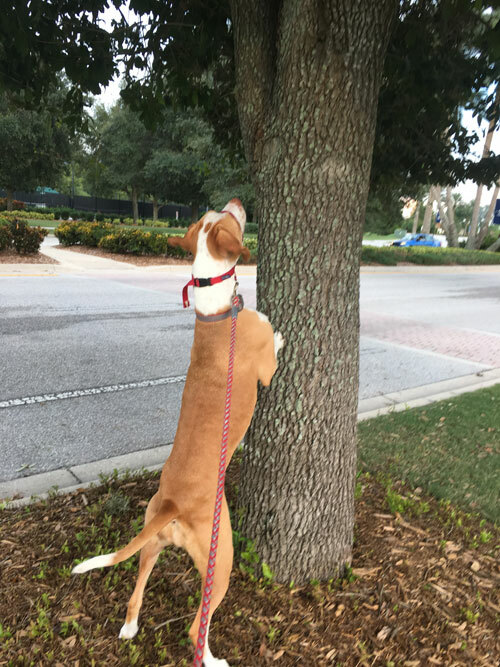 By the way, that’s a picture of me trying to chase a squirrel up a tree. I was fast but he was faster and he got away! I don’t bark much, but I do let loose when someone rings the doorbell or knocks on the door – just want to make sure people know that there is a ferocious dog in the house. I don’t like people trying to sneak around on the outside, so I will bark when I need to. My family think I’m a very good dog but I’ll let you on to a secret: I’m actually a great dog! My favorite pastime is playing frisbee. And, to their credit, my family take me out into the backyard several times a week to play. I can play any time of the day. I’m actually very good at jumping up catching the frisbee in mid-air. Stay tuned; I’ll post a video of me catching one soon. I like to play ball and I also like to fetch. But I don’t particularly care for hard frisbees. My daddy figured that out pretty quickly, and he actually got me this really nice soft and light frisbee from Amazon that doesn’t hurt my mouth or my teeth when I catch it. Before I forget, check out our Dawggie GoPak. I have 2 leashes, and each one has a Dawggie GoPak attached. They are super-convenient. Really. I’m not making it up. You can stash waste bags, keys, cell phone and lots of other stuff in them. My family even keeps LED flashlights attached to the GoPaks for those after-dark walks. They also carry some treats for me when I’m extra good (which I always am). And they carry some cleaning wipes, mosquito repellant wipes (we get a lot of mosquitoes in our part of town) and a small canister of pepper spray in case a random dog tries to “attack” us (which has happened, by the way). May I suggest that you read testimonials on the website? Oh, and don’t forget to watch the video on the homepage to get an idea of how the GoPaks work. Ok, gotta go, it’s frisbee time! This entry was posted in GoPaks, Stories. Bookmark the permalink. Welcome to Dawgs On The Go! We are Back with the Reflective Dawggie GoPak!! We are Back with the Reflective Dawggie GoPak!! Comments Off on We are Back with the Reflective Dawggie GoPak!! Welcome to Dawgs On The Go! Comments Off on Welcome to Dawgs On The Go! Ellie Mae is our 5-year old American Foxhound. She is the mascot for this website.